Despite the Warped Tour landscape changing pretty dramatically over the last decade, it’s hard to not see its continuous influence and charm. It may not be quite the same “punk rock summer camp”, it’s still one of the years biggest tours year in and year out, regardless of the genres it caters to now. Some of my favorite bands this year were throwbacks to my early Warped years and it was also filled with tons of the bands that have become synonymous with the new look and feel of Warped. As I say every year, I’d love to see more of a return to their old school roots in terms of the bands on the bill, but I understand that that’s not the direction Lyman and co. want to go so I can’t blame them. While I loved many of the bands I happened to see, this was the most disappointing line up I’ve gone for in many years and I hope next years gets a group of new and young blood. 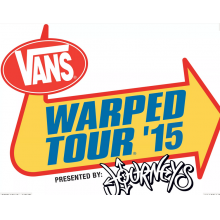 Check out our coverage from previous years of Warped Tour: 2014, 2013, 2012, 2011 – Camden, 2011 – Columbia, 2010. I chose to do Warped Tour in Camden, which is over two hours away from me, instead of the much closer Maryland date, due entirely to the fact that Matchbook Romance would be performing at one and not the other. My first Warped Tour experience came on a ridiculously hot day way back in 2003 when I vividly remember seeing Matchbook Romance play. I worked my way close to the front (something I rarely do at shows anymore) and rocked out hard for the majority of their set…until heat stroke started to set in. This was followed by the first and only time I’ve ever crowd-surfed at a show. Sure, it was only like ten people, but I did it, damnit! There may not be as much of an appreciation for them now as there was ten years ago, but it wasn’t hard to see how excited the crowd was for them when their set started. My friend Jay sprinted all the way from the farthest parking lot into the stadium in order to make it in time to see them perform and we both screamed along for the entirety of their set, even if it was only six songs. I don’t know if I still love them as much as I did ten years ago or if nostalgia took its hold of me, but it was amazing to hear “Monsters” and “My Eyes Burn” live again. I’m not sure if it’s better or worse for them, but for the most part people are familiar with Our Last Night mostly due to their amazing covers. Whether they’re covering Taylor Swift’s mega-hit “Blank Space”, Imagine Dragon’s “Radioactive” or my personal favorite – Adele’s “Skyfall”, you’d be remised to skip over their original content just because of how good their covers are. Their 2013 album Oak Island is fantastic and their new album Younger Dreams has been solid from the little bit that I’ve gotten to listen to so far. Unlike the rest of the bands on the list that you’ll read through below, Our Last Night is the only band that I’d never seen before. Given how much I’ve listened to them over the last year I was really afraid that they wouldn’t live up to my expectations, but thankfully they not only lived up to them, but they surpassed them. Brothers Matt (guitar and vocals) and Trevor (vocals) Wentworth both sounded exceptional, and main vocalist Trevor had more energy than most of the other bands on the bill combined. After some bands in recent years at Warped, it was great to have my faith restored. Can’t wait to see Our Last Night playing in a small club with a bigger set. I shot Attila at Warped Tour 2014 and was as confused by them as I was this year. Their music doesn’t fit into one genre, so trying to describe it is nay impossible. I’m not a fan personally, but I will acknowledge that they’re a great live show and I have to give props to their philosophy of not preaching anything but having a good time. While I’ve got no issue with a band bringing up a topic that is near and dear to them, it’s great to have a band like Attila just come out to party and not care about anything else. I’ve rarely found myself listening to Blessthefall in my free time, but over my years of covering Warped, they’ve brought one of the most consistently engaging shows I’ve seen on the tour. Vocalist Beau Bokan is one of the best in their genre and shows it every time he hits the stage. As an added nod to fans, ex-Blessthefall vocalist and current Escape the Fate Vocalist Craig Mabbitt came out do perform with his former band mates on “Guys Like You Make Us Look Bad”. It was awesome and the crowd definitely enjoyed it. Much like Blessthefall, August Burns Red has always brought one of the better Warped live shows, but I never find myself listening to them in my spare time. Although, their new song “Ghosts” off their new album Found in Far Away Places is really good. If you just want to bang your head, mosh and break a sweat, take the time to check out August Burns Red. After seeing Mabbitt perform with Blessthefall an hour before, it was a perfect time to head on over to the Monster stage (one of the only times I strayed away from the main stages) to check out Escape the Fate. While I tend to prefer the Ronnie Radke era of Escape the Fate, I give Mabbitt his due for all he’s done to improve the image of and raise their level of popularity. I was a bit disappointed they didn’t play “You’re Insane” or “Situations”, but other than that, great set. I’m not sure how, but I had no idea that Pierce the Veil was on the tour until I showed up and saw them on the schedule. It was a nice surprise given the fact that the only time I’d really gotten to photograph them before was a rainy day at RiotFest Chicago 2013. I wasn’t a big fan of their set then, but I thoroughly enjoyed their set at Warped. Their fans weren’t as shriek-y and the band sounded way better. Still not a huge fan of their music, but the show was much better overall. I’ve covered Black Veil Brides a few times over the years and still can’t get into them. I think I’ve got more issue with their fans than the band themselves, but they can be grating in big doses. Vocalist Andy Biersack has great stage presence and seems like a genuinely nice guy. Not sure why the band gets as much hate as they do, but they put on a great show. You can definitely tell the influence from rock acts like Motley Crue and Kiss when you watch a Black Veil Brides live show. I’ve had the opportunity to cover We Came as Romans many times over the years including Warped Tour 2013 and RiotFest Chicago 2014. With each time I see them, they seem to get better and better. I love the dual-vocal style with Dave Stephens doing the screaming and Kyle Pavone doing the clean vocals. It’s a great dynamic that seems to give We Came as Romans a great edge on many of the similar sounding bands in their genre. For the most part We Came as Romans stuck with a tried and true set list, but it was great to hear new songs “The World I Used to Know” and “Regenerate” off their upcoming self-titled album. Like Matchbook Romance, Silverstein is one of the Warped veterans that I was excited to see again. I believe I saw them way back in 2004 and have seen them many, many times since then. I covered their set at RiotFest Chicago 2014 and left a bit disappointed. Not sure if it was a one time thing or a stroke of bad luck, but they just didn’t blow me away like they usually do. Their set at Warped, however, was one of the best times I’ve ever seen them. Everyone was completely in sync and vocalist Shane Told was probably the best I’d heard him in years and had more energy than probably every front man other than maybe Trevor Wentworth of Our Last Night. I’ve seen Silverstein many times over the years and it’s great to see a band you love still impressing you after years of seeing them. After quite a few months (if not years) of turmoil amongst the members of Asking Alexandria and now former vocalist Danny Worsnop, the band took some time to reflect and replaced him with Denis Stoff, formerly of Make Me Famous. Their vocal and musical styles made him a natural choice for the band to replace Worsnop. After seeing and photographing Asking Alexandria many times over the years with Worsnop, it was really weird to see someone else taking over vocals. Sadly the vocal volume left a lot to be desired, so it was really hard to give Stoff a good critique. From what I did hear, it sounded pretty solid, though. After seeing Worsnop not care at all at Mayhem last year, it’s great to see the guys in Asking Alexandria happy, from drummer to singer. I shot Family Force 5 many years ago at Kingsfest and then again at Warped Tour 2011 and while I’m not a huge fan of theirs, they’ve got one of the most ridiculous, amusing and entertaining live sets you’ll see. While they had the giant hamster ball at Warped 2011, they might’ve outdone themselves with their eclectic stage design for Warped this year. Sadly they were playing at the end of the night as the last band on their main stage and with only The Wonder Years following them, so their crowd size was disappointing, but they still brought a great live show as I figured they would. If you ever get the chance to see them, do so. They don’t take themselves too seriously and that’s something that seems to be lacking by a lot of Warped bands nowadays.